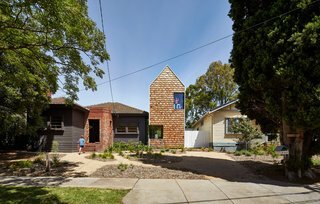 A playful renovation in Melbourne creates a series of gabled structures. 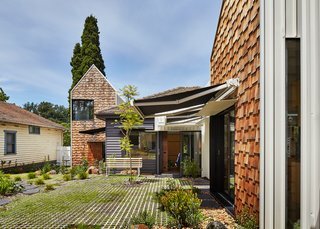 Neighborliness can seem like a thing of the past in many suburbs today, a trend that architects Andrew Maynard and Mark Austin were hoping to counter when they approached the renovation and extension of a weatherboard home outside Melbourne for a couple and their eight-year-old twins. Inspired by Sydney Opera House, Maynard, and Austin paid careful attention to the extension’s "fifth elevation"—the way it’s seen from the sky. "The roof plan, rather than the street façade, is now the most public face of a building thanks to Google Earth," they explain. 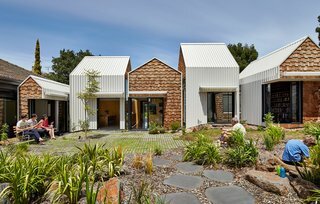 Its tiny houses, clustered at the southern end of the property, are clad in white steel panels and western red cedar shingles, contrasting materials that emphasize their geometric forms. "Increasingly Australian houses are becoming fortified under the pretence of privacy," Maynard explains. "We try to do the opposite." Instead of designing another closed-off contemporary work of architecture, the architects created a village, wherein a series of friendly, gabled structures lead out from the original house and border an open garden. 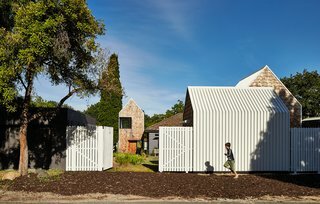 The front yard has a communal vegetable patch that neighbors are invited to use; the back fence, though tall, is see-through; and the gates are also designed to be left open wide. From the street, only the main house and one adjoining addition are visible, belying the spacious extension at the back. The architects call this the "Tardis effect," named for the time machine on Dr. Who that looks much smaller on the outside than it does within. But there’s still room for introspection. 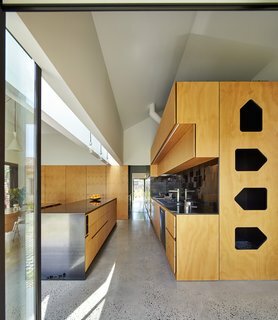 In the the main house, sliding panels divide large, shared spaces into smaller, cloistered ones. 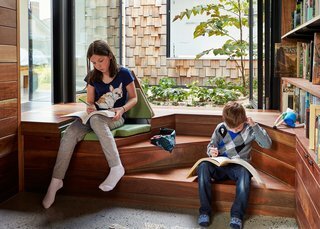 The addition also contains cozy reading nooks where the residents can quietly recharge. The home sits in the sweet, thoughtful balance between solitude and community. Spinning off the living room on the north side of the main house, the children’s study sits separately from the other pavilions. 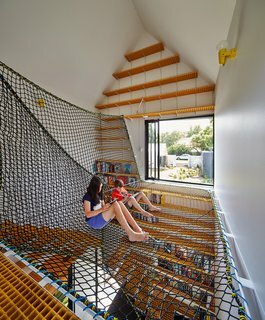 On its upper level, Oxley netting forms a web on which the kids and their friends can sit and read with views of the leafy street and garden. 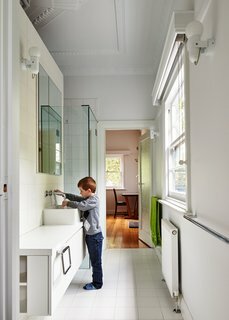 In the main bathroom, Art Deco crown molding reminds residents of the house’s past. New fixtures include white laminate cabinets and sinks and faucets by Roger Seller. The owners furnished the living room with a mixture of new and old pieces, including a Hans Wegner lounger and Tuckbox coffee table. 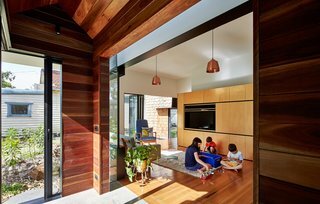 A timber-lined hallway leads out from it to the newer parts of the home. Sections of steel-framed double glazing separate and accentuate each "house" while letting in glimpses of sky. The dining room serves as the hub for all activity. Original Series 7 chairs by Arne Jacobsen complement a table Maynard designed and dubbed the "Zero Waste Table," since it utilizes every inch of a large wood sheet. To the right, a sliding door opens to the garden. "It was very important to get the integration between the garden and the house right," Maynard says. The architects worked with Bush Projects to strike that balance, laying down concrete pavers and planting native flora that add to the home’s relaxed feel. Permanent steel awnings protect windows from glare, while retractable fabric ones by Shadefactor offer residents optional shelter when they sit outside. 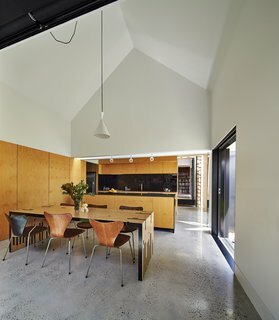 The house’s dominant gable form repeats at a smaller scale throughout the dwelling, as in the kitchen’s plywood and steel cabinets. "The gable became thematic throughout the process," Maynard explains. "Whenever issues arose, we referred back to it as a default, rather than adding a new idea." The sink is by Abey, faucet by Franke, and range by Qasair. Responding to restrictions set by local planning authorities, the architects lowered the library’s floor level to preserve its cathedral ceilings. "We try to work with problems, not against them," Maynard says. "You now descend three steps into the studio and discover the desk at garden height, rather than above it." 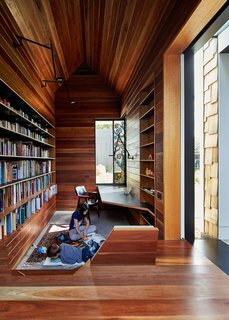 The solution also allowed for the installation of built-in reading nooks. A small country road borders the property to the west.